Polished stainless steel handrails, balustrades and wall cladding. Glazed enclosures, fittings, grab rails, press formed trims and wall claddings as well as reception desks and handrails. 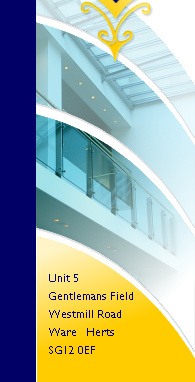 Handrails, balustrades, floor grilles, door panels and glazed dividing screens. Foot rails and bar fittings can also be fabricated to meet specific design criterea.